Let’s face it, you’ll do nearly anything to build more muscle quickly. So how can BCAAs help? BCAA supplements increase protein synthesis largely by improving protein balance, which is an anabolic trigger (3). In soldiers aggressively cycling, amino acid drinks were found to increase protein synthesis by 33% (4). That’s a pretty big boost for simply including a drink in your workout routine. BCAA supplements not only trigger an anabolic muscle response, but also reduce muscle breakdown (catabolism). A Swedish study gave 6.8 grams BCAAs to individuals performing leg press whom had never trained before. What they found, was that supplementation reduced muscle breakdown while improving muscle growth (5). The ultimate evidence of a supplement being anabolic, is if it can help you build more muscle without even lifting. Well, for the elderly, large doses of leucine did just that (7)(8). This occurs because Leucine is believed to both directly and indirectly effect protein synthesis (9). Directly through protein balance, and indirectly through myostatin inhibition. Myostatin inhibitors increases muscle growth outside of the standard protein synthesis pathway by basically blocking natural muscle-growth restrictions (10). Buzz kill: Elderly participants were likely not eating a high protein diet, allowing leucine supplementation to greatly improve their anabolic balance by basically treating a deficiency. The effective dosage we saw again and again was 7+ grams of BCAAs in the 2:1:1 ratio. We also believe that active supplementation will be more effective than passive for muscle growth. Active BCAA supplementation: Take 7+ grams BCAA alongside your pre workout before exercise. Passive BCAA supplementation: take 3-4 grams with each meal of the day, totaling 9-12 daily grams. Time and time again, studies noted that supplementing with less than 6 grams of BCAAs had to effect, so, don’t take less. Branch chain amino acid supplements (BCAAs) are often recommended alongside fat burning programs for their weight balancing effects (11). Increasing endurance for more exercise time. Reducing DOMS (delayed onset muscle soreness) so you can keep coming back. Increase in fat burn during caloric deficit without fatigue (12). Decrease in dietary fat becoming bodily fat (13). Not to mention the massive benefits associated with BCAAs ability to promote muscle growth, which can offer a great muscle tone look as you progress. A muscle tone that low caloric diets cannot offer on their own (since protein intake is often also compromised)! Note: This requires a quality rated-best BCAA powder that hits correct dosages. Skimping the serving size will not produce ideal results. 6-8 grams of BCAAs before exercise is the sweet spot. This will increase your endurance, reduce muscle wasting, and make sure you are targeting fat effectively. If you are looking to supplement outside this window to improve your protein balance – then opt for a whey protein isolate to take with your meals. BCAAs are taken just as often by individuals seeking to increase their performance as they are for lean muscle growth and fat loss. In a very detailed leucine enriched protein study performed by the Air Force, Leucine enriched protein (comparable to BCAA + protein) was found to be mildly effective at increasing strength and lean muscle in comparison to air members not supplementing (14). Japanese researchers found that BCAA supplementation before strenuous exercise increased endurance. 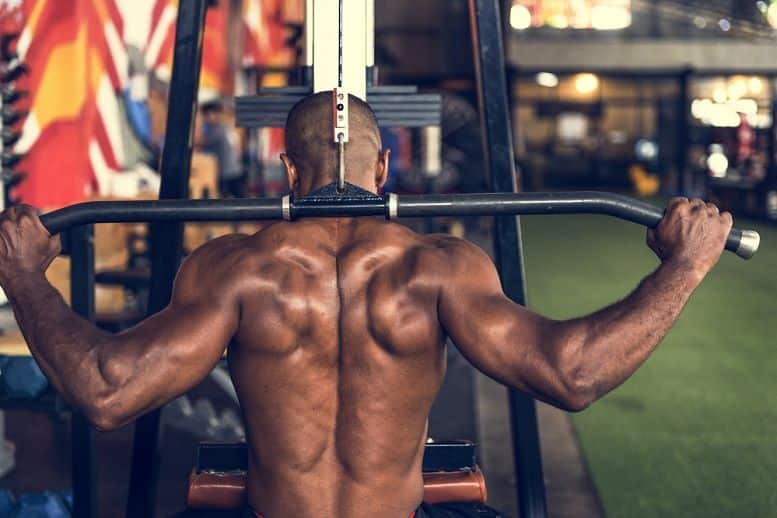 Of interest however is that the greatest effect occurred after prolonged BCAA usage, leading them to believe the body must adapt over a period of time to fully utilize BCAAs for increasing endurance (15). Juvenile athletes taking BCAAs and glutamine experienced better recovery after intense rowing, as well as greater performance (16). BCAAs can help improve endurance both on their own and long side pre workout supplements. Overall, BCAA powders are a powerful tool. Like for muscle growth and weight loss, the dosage recommendation stays the same. 7+ grams of BCAAs in the 2:1:1 ratio appear to be the sweet spot, when taken roughly 30 to 60 minutes before exercise. Anything less will not produce the same results as seen in positive clinical trials. 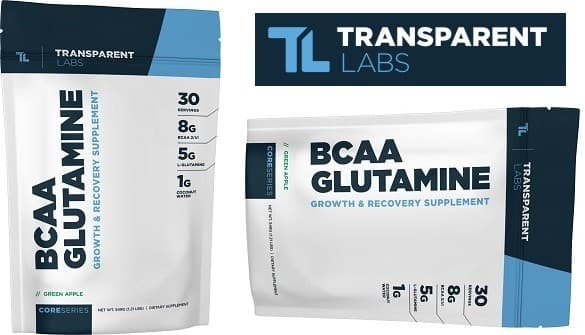 Currently, Transparent Labs offers the Best BCAA supplement on the market – BCAA Glutamine. Each serving contains 8 grams of BCAAs in the 2:1:1 ratio along with 5 grams of added glutamine. That brings the total Amino acid count to 13 grams in a single serving! Since the ratio is 2:1:1, that means you will get 4 grams of leucine per serving as well as 2 grams of valine and isoleucine each. This is an optimal pre or intra workout BCAA dose for building muscle, burning fat, increasing endurance, reducing muscle soreness, or all at the same time. The formula is free of artificial and synthetic dyes as well as contains zero artificial sweeteners. In our book, it’s a winner compared to the droves of under-dosed BCAA supplements. Scivation Xtend contains 7 grams of anabolic BCAAs in the proper 2:1:1 ratio as well as 2.5 grams glutamine and 1 gram of l-citrulline malate. In this specific ratio, both endurance, fat loss, and muscle growth is promoted. Combine this intra workout supplement with any workout day to last longer than before. 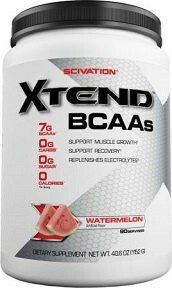 Compared to our top choice, Xtend is easily the second best BCAA powder. What separates BCAA Glutamine from Xtend is that BCAA Glutamine has an extra gram of BCAAs as well as twice the glutamine. Not to mention zero artificial sweeteners or dyes. Note: It is unclear if Xtend uses vegan-friendly fermented BCAAs or lower quality BCAAs derived from processed beef hydrolysates. Beast Sports Nutrition combines 5 grams of branch chain amino acids with 5 grams of non essential amino acids to form a 10 gram amino acid mix. 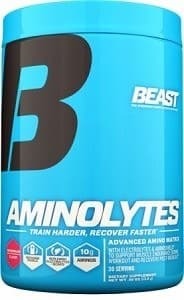 In addition to those AAs, Beast Aminolytes also provides an electrolyte blend to give you better water retention and energy. The 5 gram BCAA matrix in Aminolytes is a 5:1:4 ratio. This means that per each scoop you are getting 2.5 grams of leucine, 0.5 grams valine, and 2 grams of isoleucine. This is an interesting approach, and we’d like to see the research behind this dosage. So far, the best research has recommended a 2:1:1 ratio. Besides that, and the inclusion of Acesulfame Potassium as a preservative, we love Beast Aminolytes! 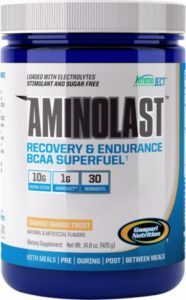 Aminolast is another fantastic tasting BCAA supplement that also backs itself up a synthetic dye free formula. 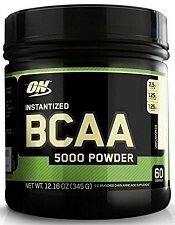 This BCAA intra workout supplement has 2.5 grams of L-leucine per serving as well as 10 grams of amino acids overall. When we took Aminolast, we felt it; both in the gym and afterwards while we recovered. Expect to have increased endurance while you lift as well as a noticeable anabolic switch which may make you hungrier between lifts. The only cons of Gaspari Aminolast is that there is only 5 grams of BCAAs. Luckily, they are in a 2:1:1 ratio so it would be worth while to double the dosage for 5 grams of leucine per serving. As a whole, this is a satisfying BCAA supplement. Like Gaspari’s Aminolast, Anabolic State was a pleasure to take. Anabolic State is another 6 gram BCAA per serving formula, however they do not tell us the exact BCAA ratio only that there is 3 grams Leucine. So, it could be 2:1:1 or it could be 5:1:4… We don’t know. But, on the plus side Anabolic state does include HICA, a metabolite of Leucine which is highly anabolic. In terms of building muscle, we would compare dosing leucine to that of taking a test booster in terms of muscle building potential. Combine them and that’s a whole other story! In all, anabolic state is a value when it is on sale. Otherwise, we love going with the supplements above. Next to the 6 grams of BCAAs and HICA, Anabolic state has some non-essential amino acids bringing the total amino acid weight up to 10 grams. 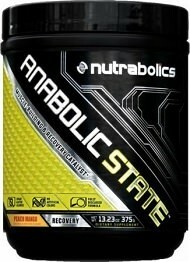 Anabolic State does taste great, but contains some bombshells like synthetic dyes and Acesulfame Potassium. 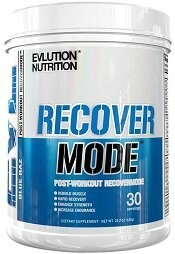 Evolution Nutrition recently released Recover Mode as their all-encompassing recovery supplement. We’ve already known them for multiple different BCAA products, such as BCAA 5000 and an assortment of others. Due to their wide range, we’re surprised that they would release yet another BCAA supplement that only contains 5 grams of BCAAs. Though, what saves this product is all of the additional ingredients making up for the low BCAA content. Recover Mode also includes: 2,250 mg Creatine Monohydrate, 750 mg Creatine HCL, 3,000 mg L-glutamine, 1,600 mg Beta-alanine, 1,500 mg Betaine, 1,000 mg L-carnitine, 1,000 mg Taurine, and 1,000 mg Calci-K. While many of these ingredients are dosed below manufacturer and clinical recommendations, hopefully together they produce good results. From here on down, quality BCAA selection begins to get weak. Keep in mind that you may need to take 2 servings to get proper dosage outlined in clinical studies. It wouldn’t be a top 10 supplements list if we didn’t have an Optimum Nutrition product somewhere. After all, they are one of the largest supplement manufacturers there is! Here we have ON BCAA 5,000 Powder. We include this under-dosed BCAA because well, its affordable so just take 2 scoops to get to 10,000 mg. Easy as that. This works out to be a better deal than BCAA 5000’s older Brother PRO BCAA. While there are less flavors to choose from, it is still enjoyable and effective. 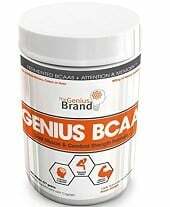 Genius BCAA isn’t as affordable as BCAA 5000 powder, however it does smartly utilize vegan-friendly fermented BCAAs just like in Transparent Labs. The only downside, is that they only use 5,000 mg per serving. In addition to these BCAAs, Genius also includes: L-glutamine, Taurine, L-Citrulline malate, Citi choline, Rhodiola, and caffeine. While they are dosed mega-low, it may improve performance. Note: we do not know a whole lot about the Genius supplement company. It appears that the majority of their business originates from Amazon where they occupy sponsored product locations. With that being said, the authenticity of their reviews is undetermined. 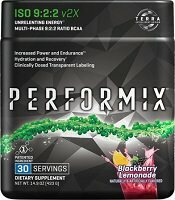 Performix ISO 9:2:2 is extremely similar to other multi-ingredient BCAA products, containing a laundry list of low-dose additions and caffeine. However, of important note is that Performix uses a 9:2:2 ratio BCAA (leucine, iso-leucine, and valine respectively). This contradicts research suggesting that the 2:1:1 ratio is the superior form of BCAA. As well, its unclear as to the sourcing of these amino acids. The only reason ISO 9:2:2 makes the list is because they’ve included PEAK O2 which is a great oxygen capacity increasing mushroom blend. 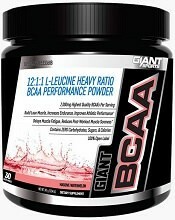 Giant Nutrition makes the same mistake as Perfomix, utilizing this time a 12:1:1 ratio BCAA. While there are 7 grams of BCAA included, this ratio is unproven and therefor gets very little of our support. Typically we like Giant Nutrition a lot! However this time they may have dropped the ball. We look forward to a proper re-formulation in the future. Hopefully one that doesn’t include negative-updates like some major brands you can see below (this shocked us). We will start with the ladies. First off, all of the BCAA supplements that we outlined above are perfectly fine for you to take. While, there are many gender customized pre workouts for women, BCAAs are pretty much unisex. However, we’ve got to recommend against taking the following products unless you are alright taking 2-3X servings per dosing window. They include: NLA Her Aminos and FitMiss BCAA. Each of these products contain less than 3,000 mg BCAA per serving. For the guys, here are popular BCAA supplements that have pathetically low BCAA dosages. They include: Dymatize Amino Pro, Musclepharm Amino 1, and Muscletech Myobuild. Now remember, BCAA powders help, but they do not run the show. At the end of the day, anyone can take BCAAs and completely abolish any potential gains with too many bad habits. So, be the best you, inside and outside of the gym. If you do that, then BCAAs may offer you an added edge that in our experience is worth having.